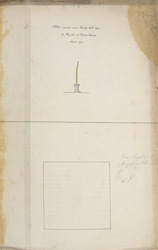 Pen-and-ink and watercolour drawing dated March 1794, of a brass-plated pillar from the Mallikarjuna Temple at Srisailam in Andhra Pradesh, from an album of 56 sheets of drawings (60 folios) mainly of miscellaneous architecture and sculpture in the Deccan and S. India, dated 1793-1806. Some drawings are by MacKenzie himself, others by his draftsmen, including C. Ignatio. When Captain Colin MacKenzie visited the temple in 1794 he wrote, " The whole of the roof and walls on the outside are covered with brass plates, which have been gilt, but the guilding is now worn off ...Opposite to the south side, on a neat basement and pedestal ornamented with brazen figures of cows, is a slender pillar (stambha) about twenty-four or thirty feet high entirely composed of brass plates; it is bent, and from the joints which plainly appear in the plating, it seems to be laid on a bamboo enclosed within. The four sides of the pedestal are covered with inscriptions." Srisailam is a very popular Hindu pilgrimage site as it is one of the twelve jyotirlingams in India. Shiva is worshipped in the Mallikarjuna Temple in his form of Lord Mallikarjuna, and Shakti his consort as Sri Bharamaramba Devi. The temple is surrounded by high enclosure walls with gopura or entrance towers on four sides. Within the enclosure there is the principal temple which is a plain structure from the 14th century with a pyramidal tower; a mandapa or hall with three porches dated to 1405 and smaller shrines and columned mandapas or halls from the 15th-16th centuries. The outer walls of the enclosure, which date from 1456, are richly carved with panels depicting processions of elephants, equestrian and hunting scenes, as well as processions of soldiers, dancing girls, musicians, pilgrims and mythical beasts. Shiva is represented in many scenes under his various aspects.